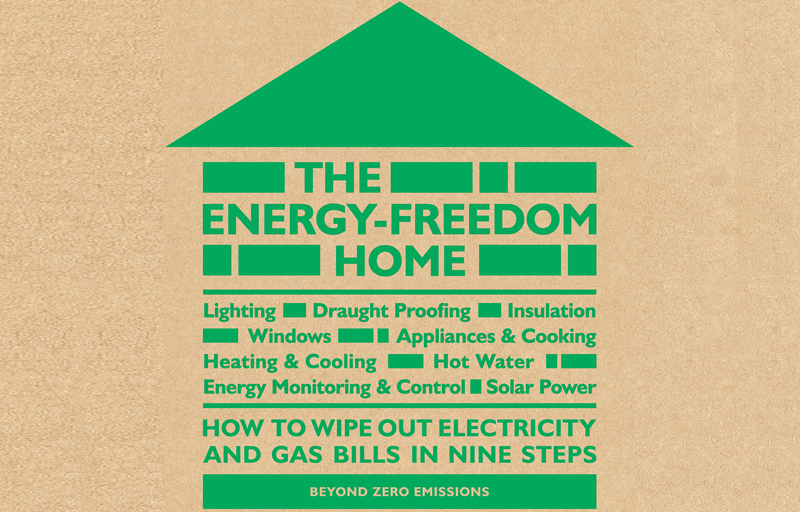 Catherine Mah reviews The Energy-Freedom Home, which outlines how to wipe out electricity and gas bills in nine steps. Beyond Zero Emissions, an Australia-based climate change solutions think tank, has come out with a guide for Aussies wanting to wipe out electricity and gas bills. The Energy-Freedom Home is an indispensable how-to guide for sustainability-minded (and/or frugal) homeowners looking to upgrade, use less energy resources, and save on bills in the long run. It’s targeted at house – as opposed to apartment – dwellers, and the outlined steps would be easier for a house owner to implement. There’s no need to go through strata approval for example, and it’s easier to install energy monitoring systems, change light fittings and have an outdoor space for hot water systems when it’s your own backyard. It may not be possible for an apartment owner to gain strata approval for all the measures outlined, and if you’re renting, you probably don’t want to invest in a property you potentially won’t be living in next year. But the principles covered are worthwhile for renters to take on board, to minimise (if not completely wipe out) energy costs. The book guides you through achieving energy freedom in nine steps, covering everything from lighting and appliances to energy monitoring and solar power. The best part is that you can make the changes over years, if tackling everything at once sounds too daunting. For those wanting to DIY, there are detailed diagrams and examples of how to implement these changes, as well as case studies and handy links to free online resources. Here are some of the top tips from the book. These are usually the ‘weakest link in a home’s thermal envelope’. Single-glazed windows are terrible insulators, letting in draughts in winter and heat from sunshine in winter. Apart from upgrading the glazing, you can also install curtains and blinds to control the amount of sunlight and create an air gap between the window and curtain for added insulation. Adjustable awnings and eaves for outdoor areas also help with shading in summer and the flow of sunlight in winter. Lighting guzzles around 13 percent of household electrical energy in Australia. Incandescent globes, including halogen lamps, convert the energy into unwanted heat that might then need to be dissipated. The solution is to convert light fixtures to LEDs, which are much more energy efficient. Whether or not you can upgrade your heating or cooling systems to a non-ducted reverse-cycle system (currently the most efficient way to heat and cool), you can make your systems work better by draught proofing your home. Check vents, exhaust fans in the bathroom and kitchen, and seals around doors and windows. For homeowners, adding insulation to the walls, ceiling and floor can cut up to 80 percent of the heating bill in winter. Solar energy and heat-pump hot water services will save on the amount of energy used to heat water, currently around 25 percent of an average household’s energy usage. Another option is to simply use less hot water. A flow control fitting on the shower head, or using a front loading washing machine on a cold cycle can cut down the amount of hot water you use, and the overall energy cost. The Energy-Freedom Home is published by Scribe and is available online.